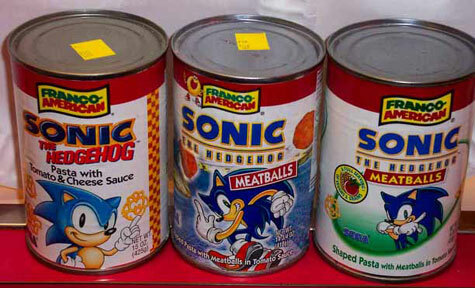 The USA had a pretty good collection of Sonic the Hedgehog related food items. Well, technically, most of them were candies or gums. They also (mostly) had the benefit of good flavors and wise choices. As usual, a lot of these were tied in with various promotions or contests. But some were just for fun. 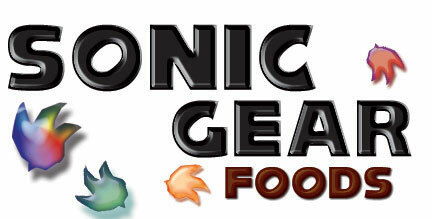 Probably the most noticed, and longest running Sonic food was a pasta...product. These canned non-noodles and meat substance were made by Franco-American. They were sold for years, and were widely available at almost any super market in the canned items isle. 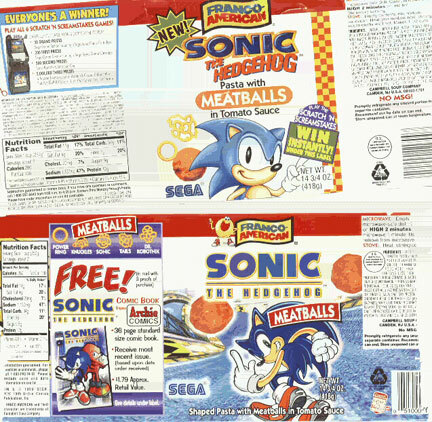 As you can see, the label evolved THREE times over the course of Sonic's design! The design of the cans did not vary much with the meatball/non-meatball content. The noodle shapes did not change, only the labels differed. I only own the can on the left. Photo credit to Juni. For most of the run of the pastas, they had a contest of some kind. The earlier one had "Sega Scratch N' Screamstakes" where you could win games, game systems, money or large arcade consoles. The later pastas carried an Archie Comics offer for a limited time. Look how the meats are flying around on the speedway! Wish you could taste some of this Sonic pasta, but missed the run in the stores? Just buy a regular can of someone's Franco American pasta shapes and eat that. They all taste exactly the same. 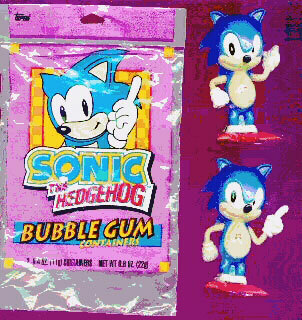 These Sonic Bubble Gums were available in 2 different containers, as you can see. They were sold seperatly, or you could buy a 2-pak later on. These were by Topps, and available at places like Blockbuster Video, and other places with minor "Candy Counter" type areas. The Sonics are full of little rattly pink gum pellet like things. They only came in Bubble Gum flavor, and the pellets are a hard-type gum. 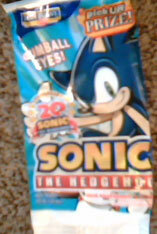 Look at the art on the package...that is a distinctly Japanese type style of old-fashion Sonic. You can still run across these guys on Ebay, but not frequently. 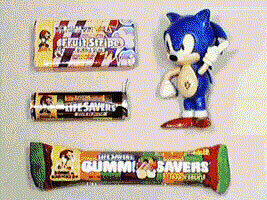 Around the time of Sonic & Knuckles on the Genisis, Sega had a contest, and Life-Savers candy, as well as Fruit Stripe gum got in on it with their candy wrappers. Not sure what the contest was...if you remember, write in. This event also contained a re-release of the above-mentioned rattly gum holders. The gum was in his head, and was little orange and purple squares. You moved his spikes to get at the gum. But what did it taste like? At the time there were several kinds of life-savers candies, including "Hot Rings" which are shown here. These were cinnamon flavored. 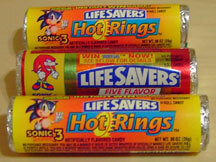 If you think about it, it's actually pretty logical to have a Sonic/Sega contest on a ring-shaped candy! You can read the package, it says "Win Sega Now" which...tells you really nothing about the contest because it is impossible to 'win sega'. Merchandise though, is the best guess. 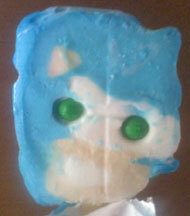 This is an old Sonic Ice cream bar or pop. 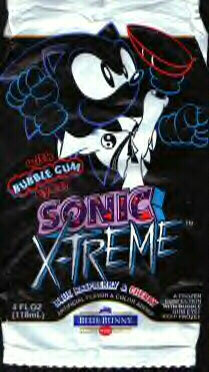 It is extremely rare, because it was made to honor a game that never came out, Sonic X-Treme. 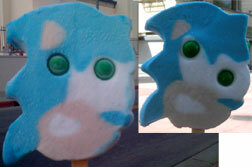 It is not known whether this is a re-packaging of the previous "Sonics head shaped Ice cream bar", or a totally different item. Naturally, you can't buy one, as it would be impossible to ship a frozen good. This also renders them nearly impossible to collect. These were made by Blue Bunny Ice Cream. It says "With Bubble Gum Eyes" but that is hard to read. 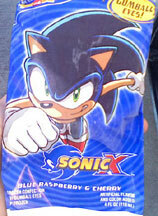 It also says that it is "Blue Raspberry & Cherry".They have Sonic attempting karate or whatever "x-treeeem" thing he's doing on the wrapper. There is a variant wrapper with him on a snowboard in the same style. 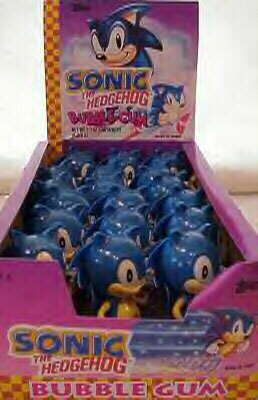 Once Sonic X arrived, they changed the packaging. Ah, and here's the actual bar itself. Not quite like the above picture, is it? Actually, it is a bit scary! The eyes are not on the white, the spikes are completely missing, his nose is smoohed and the color is 'bleeding' onto the wrong areas. 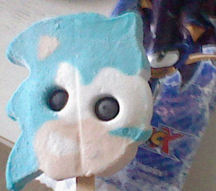 I guess it must be hard to create good likenesses in ice cream...so what prompted them to try Sonic? He's a bit difficult just by nature. Still, perhaps the quality varies depending on melting etc...? The ice cream trucks had them ever since the animated series started in the States and had them till Summer 2009 A note: it's usually the older ice cream trucks that carry stuff like the Pink Panther ice cream and the Great Whitesickle, as well as candy, that has the Sonic ice cream. The new trucks, like Schwan, don't have it. Submitter is from California, so you can be positive at least CA has a ton of those Sonic ice creams still for sale. Here is yet a THIRD incarnation of the same ice cream bar. This one probably occurred between the "X-Treme" and "Sonic X" versions on the 'time line'. (Yes, a time line of ice cream...) As you can see here, the only thing they're changing is the package, and this one is Sonic Adventure 1 Styled. More to come! 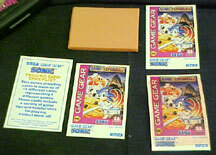 Be sure to watch this space for photos of the Game Gear gums & cards, chocolates and more! and did a whole variety of colors, such as purple, aqua, greenish and pink. As you can see, they updated the graphic to Sonic & Knuckles as well. Thanks goes to MCRG for the purple photo here! A collectible inside a collectible! 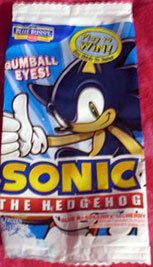 Each GG Gum came with some cardboard trading cards, made to look like game boxes. Each one had tips for the game on the back. But what about the gum? This is the food page, after all. It is a plain bubble gum, of good quality. The gum was actually in large sheets as shown above, about the size of the cards. They were not wrapped, and so were heavily powdered. This also causes the cards to smell like gum. The card at the top says there are 14 different cards in the set, representing 4 different games. Does anyone have a photo of all the cards?